Differentiated thyroid carcinoma (DTC) originates from thyroid follicular epithelial cells and belongs to a group of slowly progressing tumors with a relatively good prognosis. However, recurrences and metastases are a serious problem in advanced stages. Furthermore, progression from a well differentiated thyroid carcinoma to an aggressive anaplastic one is possible. The majority of differentiated thyroid carcinomas are sporadic but a few alleles increasing the cancer risk are known. One of them is the c.470 T > C (p.I157T, rs17879961) missense substitution in the CHEK2 gene. The aim of this study was to investigate whether this specific CHEK2 alteration, c.470 T > C, predisposes the Great Poland (Wielkopolska) population to thyroid cancer. 602 differentiated thyroid carcinoma patients and 829 controls randomly selected from population were genotyped for the presence of the c.470C allele using pyrosequencing. Hardy-Weinberg Equilibrium (HWE) was tested for both groups by chi-square distribution and Fisher’s exact test. The odds ratios (ORs), 95% confidence intervals (CIs), and p-values were calculated using the R software. The results of genotyping showed the presence of the c.470C allele in 51 patients with a frequency of 4.49%, while in a controls in 42 patients with a frequency of 2.53%. We demonstrated that in the Great Poland population the c.470C CHEK2 variant increases the risk of developing differentiated thyroid cancer almost twice (OR = 1.81, p = 0.004). The risk of papillary thyroid carcinoma in female patients homozygous for the c.470C allele was shown to increase almost 13-fold (OR = 12.81, p = 0.019). Identification of c.470C CHEK2 gene variant ought to be taken into account by healthcare policymakers. Future well-designed and larger population studies are of great value in confirming these findings. Moreover, a combination of genetic factors together with environmental exposures should also be considered. Differentiated thyroid carcinoma (DTC) originates from thyroid follicular cells and is the most common malignancy of the endocrine system. In the Polish population, it accounts for almost 1.5% of all cancers. The most frequently occuring differentiated thyroid carcinoma types are papillary thyroid carcinoma (PTC; 65-90% of cases), follicular carcinoma (FTC; 10%-35%), and Hurthle cell or oxyphilic tumors (5%). More than 2,000 new cases of differentiated thyroid carcinoma are reported in Poland each year (2389 cases in 2011) . The majority of patients are women. Generally, in various populations thyroid cancer occurs approximately four to six times less frequently in males, which indicates different molecular backgrounds between the two genders . The etiology of thyroid cancer is not well understood except for a few percent of cases that are inherited or are a part of some cancer syndromes. However, in most cases thyroid cancer results from an interaction of several environmental (chemical agents, irradiation, iodine deficiency) and genetic factors . Iodine intake plays a particular role in the pathogenesis of thyroid cancer. The papillary thyroid carcinoma is more often observed in areas of sufficient iodine diet content, while follicular thyroid carcinoma appears more frequently in areas of iodine deficiency. In Poland, during the fifteen years following the introduction of iodine prophylaxis, the follicular thyroid carcinoma frequency has decreased, whereas the incidence of papillary thyroid carcinoma and lymphocytic infiltration due to autoimmune thyroiditis has increased significantly . Most studies show that papillary thyroid carcinoma and follicular thyroid carcinoma patients have similar prognoses , but some authors reported significant differences in the behavior of follicular and papillary thyroid carcinomas, even though they are derived from the same follicle cells . Papillary thyroid carcinomas tend to grow very slowly and usually develop in only one lobe of the thyroid gland. They often spread to the lymph nodes in the neck but still have a good prognosis. Follicular thyroid carcinomas usually metastasize to distant tissues: lungs or bones. In advanced stages, they do not give such a favorable prognosis as papillary thyroid carcinomas. For unclear reasons, certain histological subtypes of papillary thyroid carcinoma may have a poor prognosis, similar to that of highly invasive forms of follicular carcinoma ,. The clinical evaluation of thyroid nodules is based on a detailed medical history, a physical examination and laboratory tests. Ultrasound examination with fine needle aspiration biopsy (FNAB) may improve the accuracy of cytological diagnosis and patient management , however, 30% of diagnoses using these methods remain inconclusive . Researchers underline the necessity to identify and validate novel markers of increased thyroid cancer susceptibility . Multiple studies on low penetrance cancer susceptibility alleles showed that alterations in the CHEK2 gene increase the risk of different malignancies . The CHEK2 gene (22q12.1) encodes the human orthologue of the yeast checkpoint kinases Cds1 and Rad53. The CHEK2 protein is activated by phosphorylation in response to DNA damage and it inhibits the CDC25C phosphatase, thus preventing mitosis. It stabilizes the p53 tumor suppressor protein, which induces the arrest of the cell cycle in the G1 phase . Falck and collaborators suggested that the ATM-CHEK2-CDC25A-CDK2 pathway is a genomic checkpoint that prevents the synthesis of DNA damaged by ionizing radiation . In the early stages of tumorigenesis, human cells activate an ATR/ATM-regulated DNA damage response pathway, which delays the progression of cancer. Mutations in the ATM-CHEK2-p53 pathway lead to uncontrolled cell proliferation, high genomic instability, tumor cell evasion from apoptosis, and tumor progression . It has been shown that four alterations in the CHEK2 gene, 1100delC, IVS2 + 1G > A, del5395, and c.470 T > C predispose the Polish population to various cancers . The most frequent of these is missense change c.470 T > C (p.I157T, rs17879961) with an incidence of 5 per 100 persons in the European populations ,,. This alteration is localized in a region coding for a functionally important FHA domain of the CHEK2 protein. The protein with a threonine in the 157 position is defective in its ability to bind p53, BRCA1 and Cdc25A proteins ,,. This altered CHEK2 protein may also have a dominant negative effect by forming heterodimers with the wild-type form . The aim of this study was to determine whether the c.470 T > C (p.I157T, rs17879961) CHEK2 allele increases the susceptibility to differentiated thyroid carcinoma in the Great Poland population. We analyzed material from 602 patients with differentiated thyroid carcinoma (527 females and 75 males) from the Great Poland region. All of them were diagnosed at the Department of Endocrinology, Metabolism, and Internal Diseases of the Poznan University of Medical Sciences. The group consisted of 535 patients diagnosed with papillary thyroid carcinoma and 67 patients with follicular thyroid carcinoma. In the examined group we did not record family history of thyroid cancers, however we noticed two familial cases of papillary thyroid carcinoma. Furthermore in 26 patients we observed also other primary cancers (Table 1). The research material was collected between 2008 and 2012, and the majority of patients were newly diagnosed. The first patients were diagnosed in 2002 and are still alive. The date of disease onset was set as the date of the thyroidectomy. Information concerning histopathology was obtained from three major clinical centers in Poznan: Greater Poland Cancer Centre, the Regional Hospital in Poznan and Heliodor Swiecicki Clinical Hospital, where patients underwent surgery. Clinical files were established at diagnosis and included age, histopathological examination results, and the TNM staging (Table 2). The control group consisted of 829 unrelated individuals (562 females and 267 males) randomly chosen from adult members of families attending diagnostic laboratories in the Great Poland region for paternity testing. The number of female controls was doubled as compared to the number of females in the general population in order to match the male-to-female ratio in the group of patients with differentiated thyroid carcinoma. All individuals agreed to take part in genetic testing and the study was approved by the local Ethical Committee of the Poznań University of Medical Sciences (approval no. 629/07). DNA was extracted from whole blood leukocytes using guanidine isothiocyanate and phenol-chloroform. Isolates were dissolved in 1xTE buffer and stored at −20°C until use. The CHEK2 c.470 T > C (rs17879961) genotyping was performed by pyrosequencing. The sequences of the primers used in the analysis were designed by PyroMark Assay Design Software 2.0 (Biotage). The following primers were used: forward 5’-GCTGGTAATTTGGTCATTGTTTT, reverse biotinylated 5’-CATTGCCACTGTGATCTTCTAT (PCR product length 142 bp, Tm = 57°C), and sequencing primer 5’-TGGGTCCTAAAAACTCTT. Pyrosequencing reactions were performed on the PSQ96 apparatus using PyroMark Gold Q96 reagent kits (Qiagen) according to the manufacturer’s protocol. Statistical analysis included crude analysis for entire groups and calculations were adjusted by gender, histological cancer type and age at disease onset. Hardy-Weinberg Equilibrium (HWE) was checked for the c.470 T > C (p.I157T, rs17879961) variant in papillary thyroid carcinoma and follicular thyroid carcinoma patients, and in control subjects by chi-square distribution and Fisher’s exact test. The association between the c.470 T > C variant and differentiated thyroid carcinoma occurrence was estimated by calculating the odds ratios (ORs), 95% confidence intervals (CIs), and p-values using contingency tables. The independence between the two variables was verified using Pearson's chi-square test and Fisher’s exact test. To assess differences in the probabilities of the occurrence of specific variable level combinations, the null hypothesis was tested against a two-sided alternative hypothesis. Statistical significance was set at p < 0.05. All statistical calculations were performed using the R software v. 3.0.1 , a free software environment for statistical computing and graphics. As the CC genotype was not present in the studied population group, statistical amendment was applied (Review Manager 5) . In molecular analysis of fine needle aspiration biopsy samples, four well known mutant genes have been identified in papillary and follicular thyroid carcinoma: BRAF, RAS, RET/PTC, and PAX8/PPARG. However, while it is possible to identify mutations in DNA from tumor cells, there is no clear information on other genetic factors associated with a predisposition to or initiation of a malignant thyroid transformation. We decided to analyze the frequency of the CHEK2 c.470C allele in a cohort of 602 Polish differentiated thyroid carcinoma (DTC) cases and 829 controls using a rapid diagnostic test based on pyrosequencing technology. 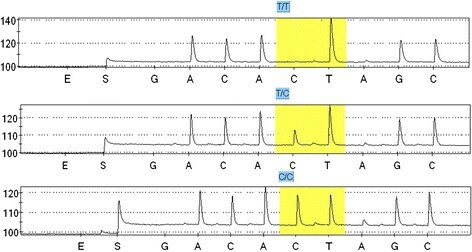 It allowed identification of three possible genotypes: TT, TC and CC (Figure 1). Pyrosequencing profiles of the three genotypes of the c.470 T > C (p.I157T, rs17879961) CHEK2 missense substitution. Polymorphic site is marked in yellow. Our results indicate that the c.470C allele is almost twice as frequent in thyroid carcinoma patients than in controls. The analysis of the allele c.470C frequency by histological type of tumor revealed statistically relevant differences between patients with papillary thyroid carcinoma and controls. Allele c.470C occurred 47 times in 44 patients diagnosed with papillary thyroid tumors (4.39%), giving the odds ratio of 1.77 (CI = [1.15-2.70], p = 0.008). In a group of patients with follicular histology allele c.470C occurred in 7 heterozygotic carriers (5.22%) – the calculated odds ratio is 2.1 [CI = 0.93-4.82], but the latter result is not statistically significant (p = 0.096) (Table 3). In bold: statistically significant numbers with 95% confidence intervals. In an analysis by gender, we observed a strong association of the c.470C allele frequency with thyroid carcinoma risk in women with odds ratio of 1.8 (p = 0.001). The female carriers of this allele (CC or CT genotype) had OR = 1.7 (p = 0.017) for thyroid cancer (Table 3). Being a rare CC homozygote increased the risk of papillary thyroid carcinoma ten-fold (OR = 10.0, C.I. = [0.52-193.90], p = 0.039). Moreover, a rare homozygous genotype CC was detected only in 3 women with papillary thyroid carcinoma (0.57%) and it increased the risk of this cancer type almost thirteen times compared to that of the general population group (OR = 12.81, C.I. = [0.66-248.46], p = 0.019). Our present data do not show any association between CHEK2 gene variant c.470 T > C and the presence of DTC in male subjects. However, it may be the result of lower frequency of differentiated thyroid cancers in males and it may be related to the small sample size (75 male patients). Studies including larger sample size would be justified. Clinical data concerning age at disease onset were available for 531 patients. We divided the differentiated thyroid carcinoma patients into five age groups and investigated the dependence between the age at disease onset as a categorical variable and the presence of the c.470C allele. The chi-square statistic was 9.76, which compared to a χ2 distribution with four degrees of freedom, gives a p-value of 0.045. We found a relationship between the presence of the c.407C genotype and age of disease onset. The c.407C genotype was more frequent in differentiated thyroid carcinoma patients diagnosed between the age of 51 and 60 (OR = 2.2, C.I. = [1.07-4.38]), and these results were statistically significant (p = 0.016; Table 4). An analysis of regional and distant metastases (as defined by the TNM classification) showed no statistically significant correlations with the presence of the c.407C allele (OR = 1.2, CI = [0.49-3.54], p = 0.694 for regional metastases, and OR = 1.1, CI = [0.24-9.31], p = 1 for distant metastases). The c.470C allele and multifocality occurred also as indepent traits (OR = 1, C.I. = [0.44-2.54], p = 0.997). In differentiated thyroid carcinoma patients, the presence of the c.470C allele of the CHEK2 gene increased the risk of developing the disease twice. A relationship of alterations in the CHEK2 gene with different types of cancer have been previously reported by others -. Studies carried out in Finland have shown a relationship of the c.470C allele with an increased risk of breast cancer with an odds ratio of 1.4 . Cybulski and collaborators detected the CHEK2 c.470 T > C alteration at a frequency of 7.1% (OR = 1.5) in Polish female breast cancer patients. They found an even higher odds ratio for women diagnosed after fifty years of age . Functionally defective variants of the CHEK2 gene have been shown to be also linked with an increased predisposition to colon cancer ,. Three changes in this gene: IVS2 + 1G > A, 1100delC and c.470 T > C were previously reported as correlated with a higher risk of five types of cancer (breast, prostate, colon, thyroid, kidney) in the Polish population by Cybulski and collaborators. However, the thyroid cancer group analyzed in their study included only 173 patients from the North of Poland, which seems low given that this is a frequent cancer, and no data on histopathological types were provided . To date CHEK2 mutations have been associated with an increased risk of cancer at several different sites, including breast, prostate, thyroid, colon, kidney, stomach, (low-grade) ovarian, bladder, chronic lymphocytic leukemia, non-Hodgkin’s lymphoma, and a reduced risk of other cancers (lung and laryngeal cancer) ,-. Variant CHEK2 c.470 T > C was also associated with breast cancer in Poland, Finland, Germany and Belarus. The odds ratio for breast carcinoma given the I157T mutation was 1.5 in Poland, 1.4 for the Finnish population, 3.6 in the German population and 4.5 in the Byelorussian population ,,. Our results confirmed also recently published research from another region of Poland (central Poland) conducted on a large group of patients with papillary thyroid cancer, which showed OR = 2.2 (p = 2.37−10) . In accordance with the results published in earlier reports, we demonstrated that differentiated thyroid carcinoma is more frequent in women. Among our patients, females were 7.5 times more likely to develop a papillary thyroid carcinoma than males. In a group of patients diagnosed with follicular carcinoma, the male to female ratio was 1:6. We hypothesized that, due to a higher risk of thyroid cancer among women, the occurrence of allele C may have a prognostic value. Actually, in our study, the presence of allele C indicated an almost two-fold increase in the differentiated thyroid carcinoma risk. A comparison of male differentiated thyroid carcinoma patients with men from the control group did not show statistically significant differences in the frequency of the alleles and genotypes of CHEK2 gene. Some earlier studies showed a correlation of this minor CHEK2 allele c.470C with an early onset of breast cancer ,. We observed a different trend for thyroid cancer: the frequency of allele c.470C was increased more than two-fold in patients who were between 51 and 60 years of age at disease onset (OR = 2.2, C.I. = [1.07-4.38], p = 0.016). However, in patients who were diagnosed at over 60 years of age, the frequency of allele c.470C was lower with and odds ratio of 0.2 (CI = [0.02-0.75], p = 0.008) (Table 4). It should also be noted that the number of cases in this group is relatively small, so in order to draw a clear conclusion, an examination of a larger group in this age range should be performed. The availability of clinical data allowed us to test a hypothesis that the rare c.470C allele of the CHEK2 gene may be correlated with metastases. A statistical analysis showed that it is not a risk factor for regional or distant metastases as defined by the TNM classification. We did not observe any correlation of the presence of this allele with metastases (OR = 1.4, C.I. = [0.55-4.01], p = 0.496) or multifocality (OR = 1, C.I. = [0.44-2.54], p = 0.997). Moreover, in 26 patients, we observed the coexistence of other primary cancers (Table 2, Figure 2). The most common co-morbid was breast cancer (9 patients, 23.4%). In three patients endometrial cancer was identified (7.8%). In this group of patients with second primary cancer, allele c.470C was present in 5 patients (19.2%). 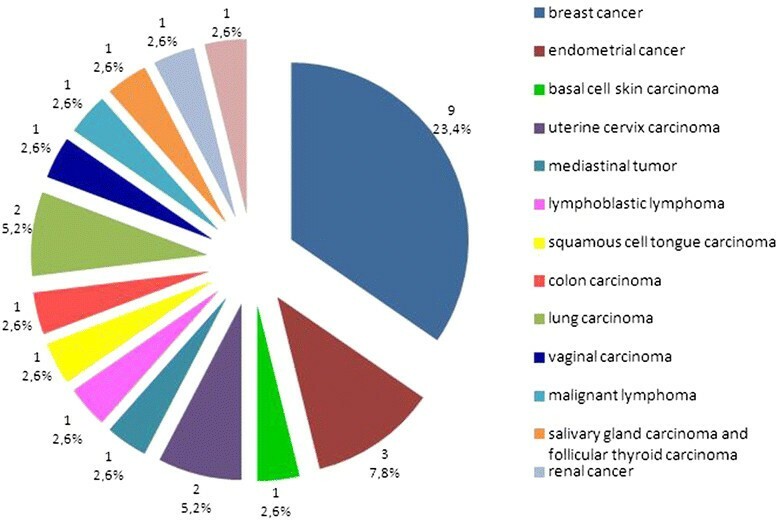 The occurrence of other primary cancers in patients with thyroid carcinoma. We identified three rare homozygotes among our patients. Two of them were diagnosed with cancer at a young age (33 and 34 years), in stage T2. Moreover, one of those patients had metastases to the submandibular lymph nodes. In the third patient, the cancer was detected at the age of 59, in stage T3N1a. Certainly, it is impossible to reach an unambiguous conclusion on the impact of the homozygotic state on the disease course based on three cases but this is an interesting finding, which suggests that being a homozygote may predispose to young age thyroid cancer. Actually, the mean cancer onset age for these homozygotes was seven years lower than for all female patients in our study. We have demonstrated that the c.470 T > C substitution in the CHEK2 gene is associated with an almost two-fold increase in the risk of papillary thyroid carcinoma in the Great Poland population, which confirms last published results for central Poland and earlier research on Pomeranian population. In homozygous women, it increases the risk of papillary thyroid carcinoma almost 13-fold. The presence of the c.470C allele significantly raises the risk of thyroid carcinoma in the midlife, but it is not a risk factor for the late occurrence of thyroid carcinoma. In our opinion, the carriers of the c.470 T > C alteration in the CHEK2 gene, especially in the homozygous state, in addition to other cancers, are also at an increased risk of differentiated thyroid carcinoma. This should be taken into account by healthcare policymakers. Population screening for this CHEK2 gene variant should be considered to be an effective strategy for differentiated thyroid carcinoma early detection and control. Marta Kaczmarek-Ryś, Katarzyna Ziemnicka contributed equally to this work. This work was financially supported by the Polish National Science Centre (grant no. NN402287436). Szymon Hryhorowicz receives a doctoral scholarship within the framework of the Scholarship support for Ph.D. students specialising in “Main development strategies for Wielkopolska” project, Sub-measure 8.2.2 Human Capital Operational Programme, co-financed by the European Union under the European Social Fund. All authors made substantial contributions to the acquisition and interpretation of data and critical revision of the manuscript. MK-R, KZ, RS and AP made substantial contributions to the conception and design of the study. KZ, BB, MG, MSz, PG and MR were involved in patient care and clinical data collection. MK-R, KZ, MT and AP wrote the manuscript. MKR, SH, JH-G, MS-Z performed the molecular analysis. KG and IS performed the statistical analysis. All authors read and approved the final manuscript.